Phil Nimmons “the Dean of Canadian Jazz” and first Juno Award winner in jazz performs with David Braid, 3-time Juno Award winner. 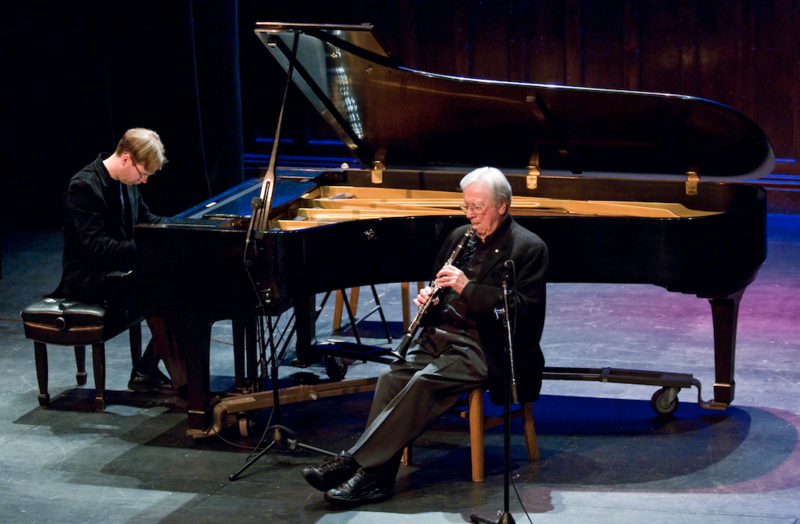 This duet between 95-year-old Nimmons and 43-year-old Braid, perform spontaneous music – improvisation without any previous discussion of structure. Their debut recording, “Beginnings” documents their first performance together. This album is a rare, unedited representation of acoustic jazz created spontaneously by two Canadian composers separated in age by more that 50 years. Recorded live in concert in November 2004, Nimmons sat in St. Paul’s United Church in Dundas, Ontario and began to spontaneously play. His formal pupil, Braid, gifted with perfect pitch, was quick to join in to complement Nimmons to produce seven improvisations which are abundant in refreshing amounts of melody, harmony and form.